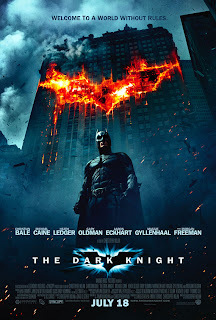 Cam's Cinematic Episodes: Film Review - THE DARK KNIGHT: A "Knight" To Remember. 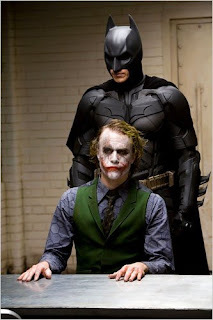 Film Review - THE DARK KNIGHT: A "Knight" To Remember. We all knew The Dark Knight was on its way. The viral marketing and media-fuelled hype guaranteed that even the peaceful fish-mongers of Bora-Bora were smearing lipstick across their lips and asking each other “Why so serious?”. We’ve followed each new superhero entry this summer, surprised each time at what well made entertainments they’ve been (Except Hancock). But there was no way that The Dark Knight would be able to withstand the hype-driven frenzy and deliver on the scale that Hellboy II and Iron Man did, was there? Well, imagine my thankful surprise when The Dark Knight, helmed by returning director Christopher Nolan, blew past my sky-rocketed expectations akin to the Batmobile charging through the Axis Chemicals factory. I apologize for the esoteric reference, but this is a film that had every neuron of my movie-nerd/Batman-fanatic brain exploding like Canada Day fireworks. The Dark Knight is a gritty, epic-sized crime story that dispenses with almost all of the established strengths of Batman Begins, leaving only the central cast and a few remaining story bits. Now we are reintroduced to a much brighter and realistic Gotham City, which looks suspiciously like Chicago. Crime has been on the low since Bruce Wayne, posing as the shadowy Batman, (Christian Bale) took on the job of city watchdog, and the recent arrival of hot-shot District Attorney Harvey Dent (Aaron Eckhart) holds great promise for a prosperous future. 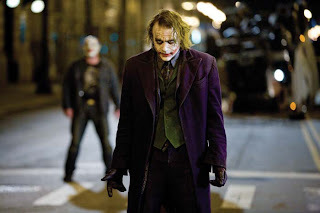 However, a new threat has emerged in the form of a shuffling, tongue-wagging psychopathic clown, with a tel ephone-pervert voice, known only as the Joker (Heath Ledger). Aligning himself with the desperate remainder of Gotham’s mob leaders, Joker, who lacks any desire for superficial profiteering, is determined to reduce Gotham City to a state of pure chaos and anarchy. Why? Because it’s just SO much fun, silly! To combat the problem, Batman, the diligent Lieutenant Gordon (Gary Oldman) and golden-boy D.A. Dent create a union to work towards capturing the Joker and restoring order to their increasingly frenzied city. 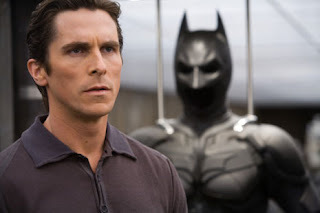 They are aided, in varying degrees ( and often unknowingly), by Bruce’s former love interest (And Harvey’s current squeeze) Assistant A.D. Rachel Dawes (Maggie Gyllenhaal – taking over for Begins’ Katie Holmes), Bruce’s loyal butler Alfred (Michael Caine) and Wayne Corp. president Lucius Fox (Morgan Freeman). Co-writer/director Christopher Nolan uses these events, and expertly illustrated characters, as a means to explore serious moral and ethical ideas regarding justice and power. Batman may have noble intentions, but he is also a magnet for deranged lunatics who will only further hurt the people that he has sworn to protect. As well, the relationship between him , Gordon and Dent has shades of The Treasure of The Sierra Madre in how a pact between assenting minds can lead to tragedy and unfortunate ethical compromises. 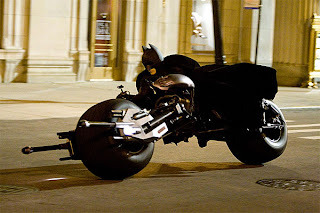 There is a lot of action, including a spectacularly explosive French Connection-inspired chase (with the best physical and CG effects I’ve seen in eons), in The Dark Knight, but there are also negative repercussions associated with it, and Nolan doesn’t shrink away from putting his characters through emotional and physical pain. There are few great triumphs here, in fact the end results fall more into semi-failure territory. Yet, Nolan underscores the importance in the moral victory underneath the apparent misfortune. The ending, a bleak development, is more satisfying that most action films, as we feel like we’ve taken a journey through the character’s psyches and fully comprehend the themes and ethical resolutions that Nolan is imparting. Harvey Dent's line "The night is always darkest before the dawn" might as well be Nolan's mission statement, as everyone is going to suffer beyond their wildest dreams on the path to redemption and growth. 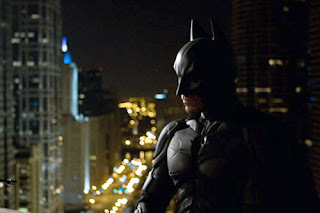 And yet, despite all the moody heaviness, The Dark Knight is the most exhilarating movie-going experience of the summer. Credit has to go to Heath Ledger, who has creat ed the definitive portrait of the Joker. Unlike Jack Nicholson, who provided an amped-up exaggeration of his own bad-boy persona, Ledger simply disappears underneath the matted on grease-paint. His Joker is terrifying and blackly funny (His “Magic Disappearing Pencil Trick” is a moment of shocking virtuoso genius), a “dog chasing cars” who casts a spell on the audience every time he prowls into frame. His final scene, which effortlessly captures the truth behind his and Batman’s relationship is an exhausting, yet inspired success. I don’t feel I’m going too far into hyperbole-land in stating that he is a classic villain for the ages, alongside Darth Vader, The Wicked Witch of the West, Norman Bates and Hannibal Lecter. You just wait and see. Christian Bale continues to erase painful memories of George Clooney and Val Kilmer. He makes us experience the internal turm oil of Bruce/Batman, and feel his frustrations – Especially in the film’s best scene, a captivating interrogation room scuffle between him and Joker. Special attention must also go to Aaron Eckhart, who makes Harvey Dent’s fall from grace positively heart-breaking. It was a masterstroke to build the central narrative around Harvey Dent, as the added exposure builds up our trust and faith in the character, making his physical and emotional damage Shakespearean in scope and effect. Eckhart, as Two-Face, doesn’t give as showy a performance as Ledger, but it is still an equally riveting creation. Gary Oldman, the most unfairly ignored of the central cast, gives an equally powerful understated performance. His Jim Gordon is sturdy and overburdened, and we can feel the weight dragging him down. He is the true source of strength in the picture, and the most relatable to the audience. Also, Maggie Gyllenhaal adds an affecting gravitas to her Rachel Dawes. We can understa nd why both Bale and Dent are attracted to her brainy resourcefulness, and why her fateful developments are so powerful. Michael Caine and Morgan Freeman have the thankless jobs of exposition readers, but handle the chore with aplomb. Caine has some inspired moments involving a sensitive letter, as well as a terrific monologue regarding an unconventional bandit. Attempting to explain the magnificence of The Dark Knight in such an economical number of words is nearly impossible. It’s among the finest works of recent mainstream cinematic art I’ve witnessed, and easily the most intellectually fascinating entry in the ever-broadening genre of superhero films. I’m act ually nervous about how Nolan will (If he comes back) be able to even come close to matching the quality and inventiveness seen in The Dark Knight. I’ve seen it twice now, and each time I’ve emerged from the theatre tingling with excitement, in a state of wondrous awe. ...And with a big smile plastered across my Joker-loving face. P.S. : I love how Nolan keeps resurrecting washed-up former tough-guys for these films. First it was Rutger Hauer in Begins, now Eric Roberts! I think it's time to bring my homeboy Steven Seagal in for part 3!